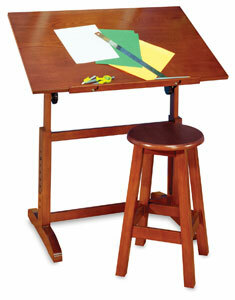 This table and stool set is a great work station for the artist, student, or hobbyist. It features an adjustable-angle work surface with a drop-down pencil ledge. The height is adjustable from 24-1/4" to 35-1/2". Durably constructed.